Fluffy no-bake white chocolate cheesecake. A rich dessert that’s delicious served with tangy raspberry coulis. You will all know by now how much of fan I am of my no-bake treats on this blog. I always enjoy testing and creating different kinds of no-bake desserts, especially no-bake cheesecake recipes. 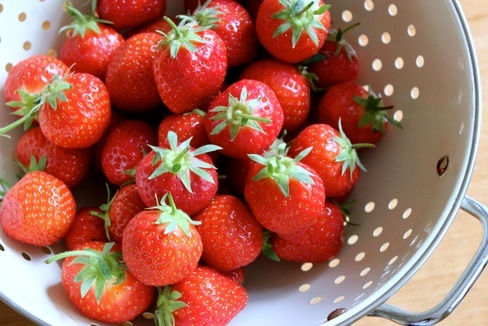 Now it’s officially spring it’s time to share some fresh fruity desserts and recipes. I’m kicking off the season with this white chocolate cheesecake. Consisting of layers of buttery digestive biscuit base and creamy smooth white chocolate cheesecake. 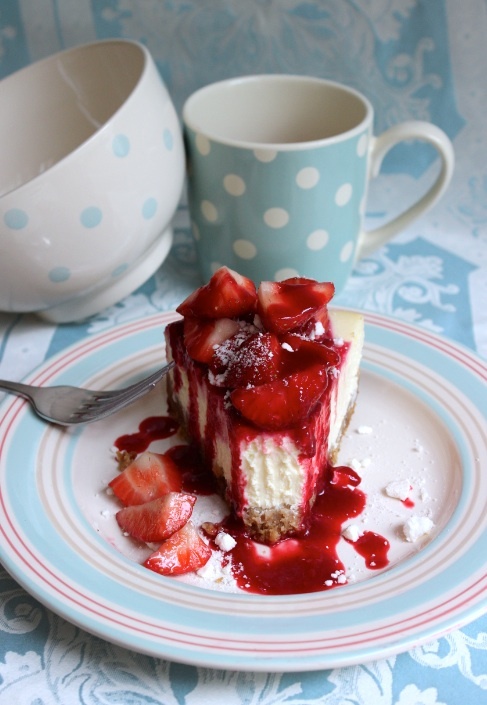 Each slice is served with a drizzle of homemade raspberry coulis which contrasts beautifully with the cheesecake. 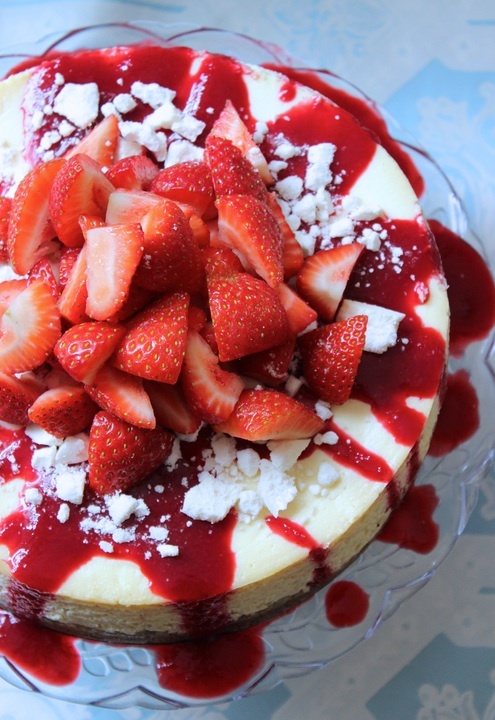 We served this cheesecake for guests we had over the Easter weekend for a dinner party. It was requested I make a dessert for our cheesecake loving friends and this recipe certainly impressed. Each slice cuts perfectly and holds its shape even without gelatine. You can serve the cheesecake with an assortment of mixed berries but I think the raspberry coulis and fresh raspberries really compliment the white chocolate. To make the biscuit base: Break the digestives up into smaller pieces. Place in a ziplock bag and crush with a rolling pin or place the biscuits in a food processor and process until they’re fine crumbs. Mix together with the melted butter. Press the biscuit crumbs into a 23cm springform cheesecake tin until compact and firm. Leave in the fridge whilst you make the cheesecake filling. To make the cheesecake filling: Melt the white chocolate over a bain-marie or in a heatproof bowl in the microwave in 20-second intervals. Leave to cool slightly. Beat together the softened cream cheese and the melted white chocolate until smooth. In a separate bowl whisk the cream, icing sugar and vanilla until soft peaks form. Fold the cream in two batches into the cream cheese mixture. 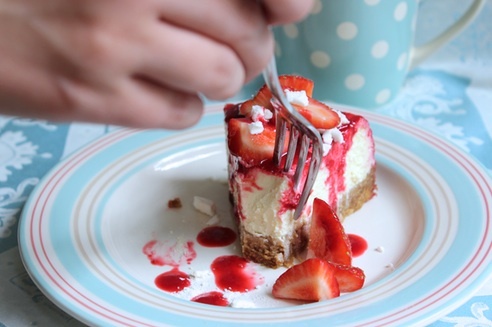 Spread the cheesecake filling onto the prepared biscuit base and smooth over with a palette knife or spatula. Cover and leave to set in the fridge for at least 6-8 hours or preferably overnight. To make the raspberry coulis: Place the raspberries, icing sugar and lemon juice/water in a small saucepan. Heat gently and continue to cook until the raspberries break down and you’re left with a thick and glossy sauce. Take off the heat and pass the coulis through a fine mesh sieve into a clean bowl. Discard the seeds. Leave the sauce to cool before refrigerating. Serve the cheesecake with white chocolate shavings, the chilled raspberry coulis and some fresh raspberries. Cheesecake will store in the fridge in an airtight container for up to 3 days. So a few weeks ago, the lovely people from Laura Ashley contacted me to see if I would like to create a recipe to be featured on their blog. I’ve been really busy with exams, college and with lots of other bits and bobs that I haven’t had enough time to blog and share my recipes and tell you this amazing news. Also, a few days ago I finally bit the bullet and decided to buy my own domain, so you will probably notice this blog address is now whatjessicabakednext.com! But now I’ve finished for the whole Summer I will now be able to post a lot more frequently (which I hope is great news for you!). But back to this post, in particular I was asked to develop a recipe that was an English classic. So as I love dessert, cheesecake and Summer, my most favourite dessert sprung straight to mind. Eton Mess is possibly the most quintessentially ‘English’ dessert out there- so I knew it would fit the bill perfectly. Luscious, fresh Summer berries mixed with whipped cream and crumbled meringue. If that doesn’t sound like the most perfect dessert, then I don’t know what does! And as I’m the world’s biggest cheesecake fan, it thought it would be fun to combine my two favourite desserts. 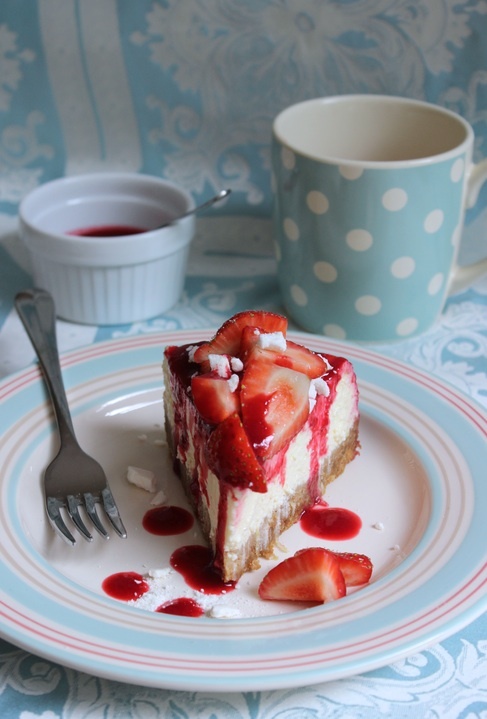 This cheesecake tastes amazing, it’s light, summery and very decadent with the fruit and meringue topping. And a definite popular dessert recipe for any occasion. Enjoy guys! I’ve used my favourite baked cheesecake recipe. I like to use ricotta in the cheesecake mix and I’ve also added some lemon zest and juice to give the cheesecake extra Summer-y flavour. A crumbly, sweet digestive biscuit base is followed by a smooth, creamy layer of lemony ricotta mix and then topped off with a drizzle of fresh raspberry sauce, crumbled meringue and chopped fresh strawberries. This recipe is great for any occasion and it’s sure to be enjoyed by anyone who tries a slice. Also, the ‘traditional’ Eton Mess uses either raspberries or strawberries, but as I LOVE both fruits I decided to combine both into this amazing dessert! (To make coulis- place all ingredients listed in saucepan, boil for 5 minutes, then pass through a sieve into a bowl. Cover and place in fridge for a few hours or overnight to thicken). 1. Start by making the base: Crush the biscuits until you have fine crumbs- you can do this in a food processor or in a disposable bag with a rolling pin. Mix the biscuit crumbs into the melted butter. Press down into a 23cm springform cheesecake tin and make sure it’s really well compact. Place in the fridge whilst you make the filling. 2. For the filling: Mix the ricotta, cream cheese lemon zest and juice, eggs and caster until you have a really smooth mixture. Carefully pour the filling on top of the chilled base. Before baking, fill a deep baking dish with boiling water and place at the bottom of your oven. Bake at 140 degrees C Fan for 1 hour 10 minutes. Once baked, the cheesecake should be set around the outside, but should still have a slight wobble in the centre. 3. Then turn off the oven, leave the oven door open a little and allow the cheesecake to cool to room temperature. Once fully cooled, cover with some tin foil and place in the fridge to finish setting overnight- this is the vital step to stop the cheesecake top from cracking. 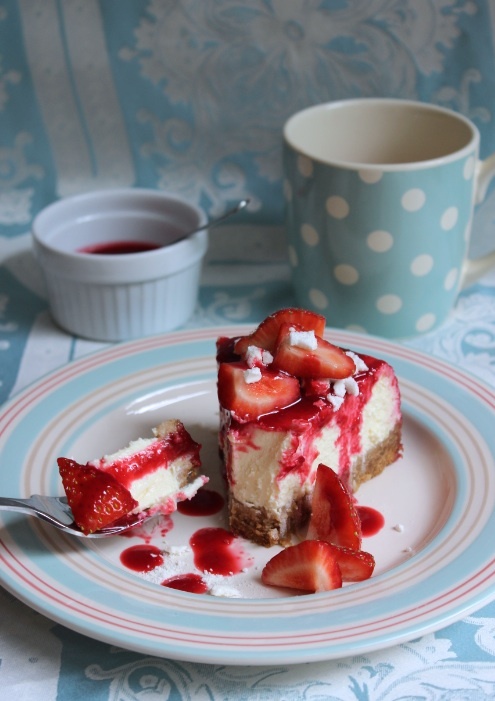 To serve: Once the cheesecake has set overnight it will even more well set and will cut a lot easier- I serve the cheesecake with some raspberry coulis. Then top with strawberries and crumbled meringue. Always fill a baking dish with boiling water and place at the bottom of your preheated oven. This creates a steamy environment in the oven and the cheesecake will bake more evenly. Once the cheesecake has cooked for the full amount of time, turn off your oven, leave the cheesecake inside with the door ajar. It will slowly cool down to room temperature and won’t crack on top- never put a warm cheesecake straight in the fridge. 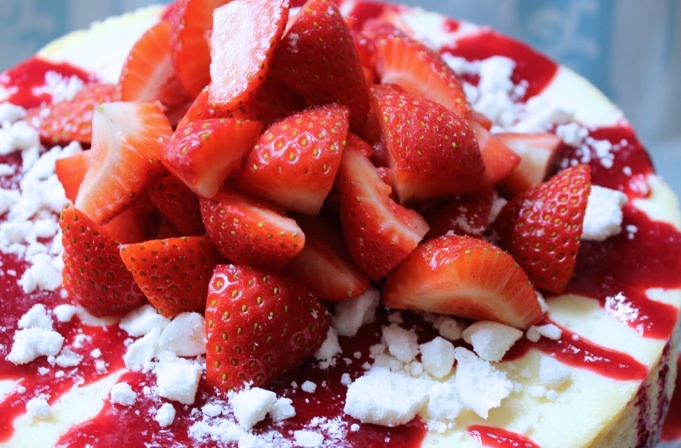 When decorating, top with the sauce, crumbled meringue and strawberries just before serving. *Note*: the cheesecake can be made in advance and left in the fridge completely covered for 2 days before decorating with the toppings. 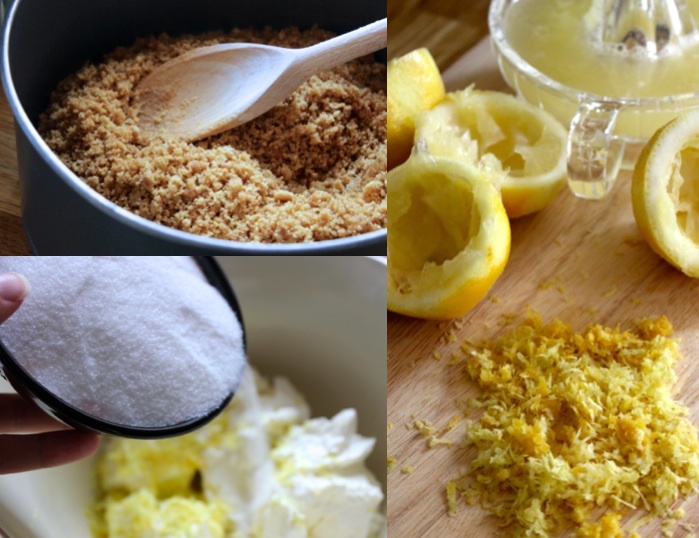 Enjoy this recipe everyone, and do pop over the Laura Ashley Blog to find this recipe! I’ve got some amazing recipes lined up for you all, so watch out for those in the coming weeks!